A complete guide to the band Cheeky Monkey. 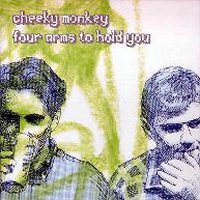 Cheeky Monkey "Four Arms To Hold You"
Way back around 1997 Michael Shelley was living in Brooklyn - bartending, playing music and doing a weekly radio show at WFMU where he came across some of the first few 7" releases on the Glasgow based SHOESHINE label. He liked what he heard, and thought his newly finished debut lp "Half Empty" shared some of the same musical sensibilities as the SHOESHINE releases. Michael sent an email to SHOESHINE asking if they were looking for any acts to sign and if he could send a tape over. Michael received an email back from SHOESHINE's Francis Macdonald saying "We're not looking, but send a tape if you like...". Michael knew Francis as the drummer/songwriter of the BMX Bandits & Teenage Fanclub, and his work with quite a few of the bands from the Glasgow scene. A few weeks later Michael got a call from an excited Francis, who had received the tape and was listening to it & playing it for friends (and even for his Mom). The two talked for hours that first day. It turned out they had a lot of favorite music in common. At some point in that first conversation Francis suggested they write some songs together. Michael received a cassette tape with song ideas from Francis shortly after. The first thing that caught his ear was a snippet of Francis singing the chorus of "I Wanna Live With You". Michael wrote some verse ideas & played them over the phone for Francis - together they worked out the bridge & finished the song up over the phone. Very exciting! A few more songs were fleshed out over the phone and then in person, when Francis was visiting New York for a few days. The night before the recording began some covers were learned up: Michael showed Francis the Chixdiggit song "Gerry Cheevers" and Francis showed Michael Alex Chilton's "Free Again." The album was recorded at Riverside Studios, in Busby, Scotland (just outside of Glasgow) in just three action packed days with Francis & Michael doing all the playing and singing. One way they saved time was by NEVER listening back to anything they recorded. If a take felt good, they moved on. The record ended up doing well in the UK & Spain, The U.S. and Japan. The album also was released on an excellent looking 12" LP record on SHOESHINE, most of which got sold in Japan. The Japanese CD version had one bonus track "Free Again" (a cover of an Alex Chilton song) which was also released as the b-side of the "I Wanna Live With You" 45 on Shoeshine. In 1999(?) Cheeky Monkey (augmented on bass by Mark Scrufari) played their only live shows when they did a really fun two week tour of Spain playing some shows with The Zeros. Transatlantic duo Michael Shelley and Francis Macdonald get together to make “sweet jangly music” -- NME. If you live in the USA and want to buy a copy visit the buy stuff page.